TORONTO — Alfonso Cuarón’s autobiographical “Roma” puts front and center characters usually relegated to a movie’s background. So it’s fitting that, in neorealist tradition, Cuarón would cast a nonprofessional for the lead role of Cleo, a young housekeeper in 1970s Mexico City. Cleo is based on Cuarón’s beloved childhood nanny, Liboria Rodríguez (the film closes with the simple title “For Libo”), who became pregnant out of wedlock when he was a child and who to this day remains close to Cuarón’s family. After an extensive search, Cuarón cast preschool teacher Yalitza Aparicio, 24, who hails from a village in the Oaxaca region of Mexico. “Roma,” which opens in Boston Dec. 6, is Cuarón’s intimate and epic portrait of his old neighborhood, told from the point of view of Cleo as she tends to a middle-class family going through domestic upheaval. Cleo, meanwhile, deals with her own economic and romantic travails, all set against the backdrop of social and political unrest. Aparicio had her own Cleos to draw on for her portrait of maternal empathy, which anchors the film. Her performance has drawn critical praise and awards talk. “I based Cleo on my sister and my mother. My mother is a domestic worker. I have done it, too; not as a full-time job but to help my mother,” says the soft-spoken Aparicio through an interpreter in an interview at this year’s Toronto International Film Festival. Another woman, Cleo’s employer, Sofia, looms large in “Roma.” Based on the filmmaker’s mother, Sofia is played by Marina de Tavira, a prominent Mexico City-based stage actress. Sofia is the mother of four children and married to philandering Dr. Antonio (Fernando Grediaga), who eventually leaves the family just as Cuarón’s own father did. De Tavira’s Sofia navigates a complex relationship with Cleo as her employer, confidant, and friend, with class differences separating the women just as love of family bonds them. “Sofia wants her children to love Cleo; she lets them love her and become close. But at the same time, she’s not part of the family,” says de Tavira who went through a long and rigorous audition process. “I was constantly saying, ‘Breathe: Don’t want it too much,’ ” she says. Cuarón, who won the best director Oscar for “Gravity” (2013), returned to Mexico to film for the first time since “Y Tu Mama Tambien” (2001) to make “Roma.” He not only wrote and directed the film but also edited and shot it himself on digital 65mm in naturalistic, luminous black-and-white. His frequent collaborator, the Oscar-winning cinematographer Emmanuel Lubezki, who’d done much of the pre-production work, was unavailable once filming began. 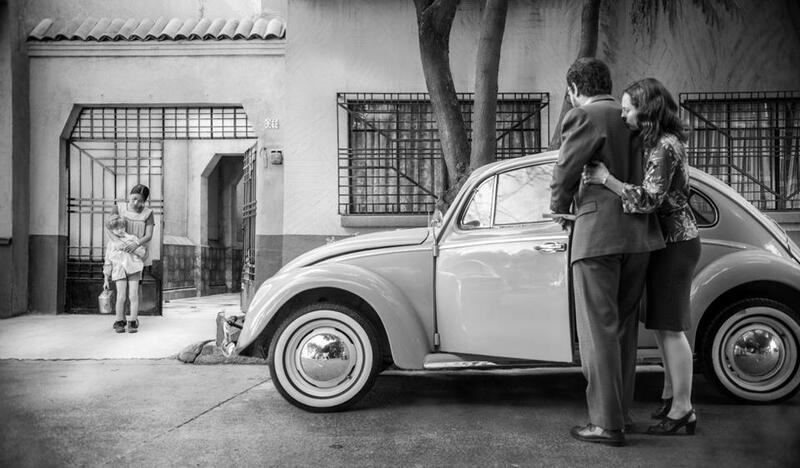 Cuarón shot “Roma” chronologically, without letting the actresses see the script ahead of time. To re-create the filmmaker’s childhood memories with authenticity, production designer Eugenio Caballero reconstructed the interior of the Mexico City house that Cuarón lived in as a boy, using the family’s actual furniture and decor that Cuarón owned or that he collected from family members. The “Roma” house features original artifacts, including a framed portrait of Cuarón’s mother; another painting, of Cuarón as a child; and family books, toys, and games stacked on bookshelves. There were even items placed in drawers, say the actresses, that they saw but that remained hidden from the audience. “Alfonso provided his heart and that opened the door for everybody to know this personal story,” says Aparicio. Loren King can be reached at loren.king@comcast.net.